This Junior Girl Scout uniform was made between 1968 and 1973. It is the second style of Junior Girl Scout uniforms. In the 1960’s the rank of “Junior” Girl Scout was added in a restructuring that divided the girls into 4 age levels: Brownie, Junior, Cadette and Senior. Each level promoted learning and growth based on the needs and interests of each age group. Junoir Girl Scouts were fourth, fifth and sixth graders (age 9-11). They had 47 different proficiency badges they could work toward, with the goal of most badges being exploration of various topics. The Junior uniform was modeled on the Intermediate uniform of the 1950s with a few changes. The Junior tie was only available in yellow as opposed to several colors that had been available to Intermediate Girl Scouts. The badge sash was first introduced in the 1950s and its use continues today. Dress, tie and hat on loan from Kathy Claussen. Sash on loan from Susan Moe. Girl Scout Cookies are available here at the Museum as well. 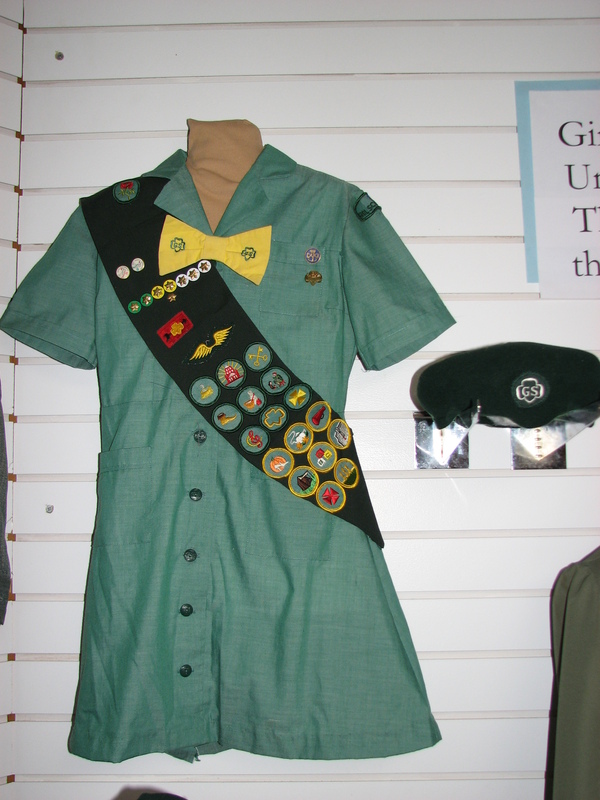 This entry was posted in Collection Notes, Museum updates and tagged 100th anniversary, 1960s, Girl Scout, Girl Scout Uniforms, Glenwood Girl Scouts, Junior Girl Scouts, Pope County Museum, proficiency badges, Vintage Girl Scout Uniform. Bookmark the permalink.